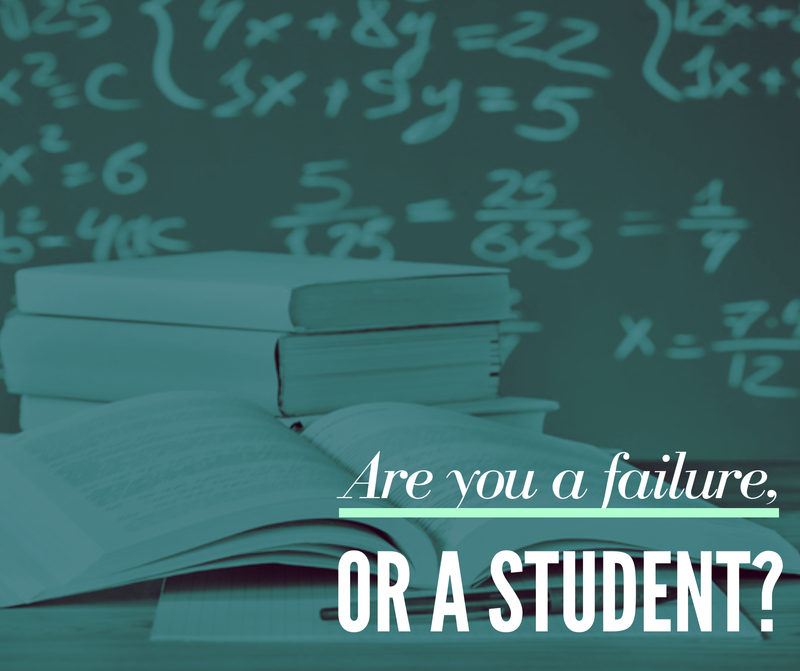 Are you a failure, or a student? Are you a failure? I am. Many times over. Many! I have failed at my job, in business, as a parent, as a partner, a friend, and as an every-day person. Even more the point, I have failed at being a healthy every-day person. But how lucky am I? I am incredibly fortunate. Am I really a failure? I think not. None of us are. I have failed, but I am not a failure. I sit in my classroom, sometimes ready to answer back the teacher. Sometimes I don’t see the point of the lesson because I don’t want to sit there that day. I didn’t want to get out of bed, get dressed, and turn up to just sit at my desk for hours and be lectured to, or tested, or disciplined. I would so much prefer to buck the system! We are all individuals with different learning styles and different personalities. We encounter different classrooms with different teachers and peers. The subjects also change all the time. Maybe this is just a stupid metaphor, but it relates, for me, to my life! My point is, even though we have all these conditions, routines and challenges, it is up to us how we learn from them. You are never going to know absolutely everything, about every subject or every relationship in your life. Especially your relationship with yourself. What kind of student are you? Are you the compliant, the rebel, or maybe the average? Or are you the conscientious? We all have a basic understanding of what all the descriptions of these “types” are, and we can all identify with one or more. I think I have been all of the above throughout my life at different stages. Most of my schooling days I was an average student, but before my Mum died during my final year at school I was a bit of a rebel. I wanted to do things my way. There were many opportunities to learn lessons but I didn’t want to hear, or realise, that someone else’s way of looking at an issue just might have been the best way forward for me. After Mum died I was still a rebel, still doing things my way, but much more compliant. Entering the workforce, studying, and my first relationship meant for me that through my experiences in life, I reacted to, and perceived situations how I thought I was meant to. I remained compliant until towards the end of my first marriage when I figured out that being this kind of person really wasn’t leading me down the right path. But that is a whole other story for another blog on another day…! During my mid 30’s I started to become much more “conscientious” in my life. I started to see and react to situations differently. I was waking up to the concept that I didn’t have to think and feel and behave a certain way just because everyone else did, or because I was told to. I was still the ever learning student, but I had the power to take responsibility for my choices and make some changes. I started to do the work, do the study and really put in some effort. I realised that by seeing the lesson for what it was, and knowing that I could do the work in creating change within myself, that I could change my path. And I did. In a big way. My new husband, Phil, would probably say I am a rebel! I can see the look on his face so clearly! I still also have the tendency to be compliant and I certainly have my average days, but mostly I am conscientious. As I have been going through my Breast Cancer journey over the last two years, I have learnt so much. I have been observing, listening, and increasing my awareness. I have also been doing the work. I have still failed, many times. And I am sure I will continue to fail some more. However, through some incredible people who are experts in teaching the curriculum of life, no matter what results I achieve, I am the most successful student I can be. Which one have you been in the past, and which one do you prefer to be now after a few more years of being on this roller coaster called life? Nice one. It is not so easy for one to move on after failing, but I have come to realize that one of the teachers in the school of success is failure. Every successful person today all had their fair share in the dealing with failure. Thank you for your contribution to making the world a better place with your messages. Thank you. And failure (or learning) is essential to our success! This reminds me of the saying, “Your past does not define your future.” Great work! Thank you for this. Let’s keep learning! And we’re not failures as some of my biggest learning experiences come from those tough times 🙂 Great post!